If you drive the many freeways in California you have likely found yourself sitting in traffic (yeah sometimes we are on the freeway just sitting in our cars going nowhere fast) only to be startled out of your daydream by a motorcycle whizzing by, between you and the car in the next lane. 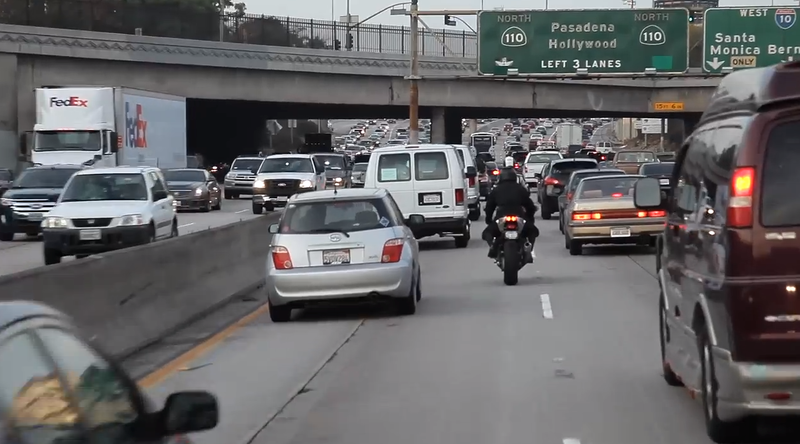 It’s called lane splitting when motorcycles do that and it is completely legal in California. Even when traffic is moving along at speed, motorcycles can ride right up next to you in your lane and in between lanes of cars. Sounds crazy right? Well that may be why California is the only state in America that allows it. Actually lane splitting, or lane sharing as it is sometimes called, is not really legal per se. It is just not illegal. It occupies a gray area in policing and traffic laws. Law enforcement people acknowledge this, and indeed do it themselves as motorcycle cops lane split all the time, and often zoom by right in front of or behind a line of other motorcyclists. The general rule according to law enforcement is that as long as the rider is not deemed to be doing his or her lane splitting in a way that is particularly dangerous or reckless, then there is no violation. Of course to motorcyclists lane splitting is one of the bonuses of riding a bike. When four wheelers are moving slowly due to traffic congestion, motorcyclists, due to the slim profile of bikes, can just lane split and zoom right through, cutting commute times way down compared to drivers. In fact I would speculate that is one of the reasons California allows lane splitting, to encourage more riders as a means of cutting down on cars and emissions. It is why motorcycles are allowed to ride in car pool lanes after all, even when riding alone. 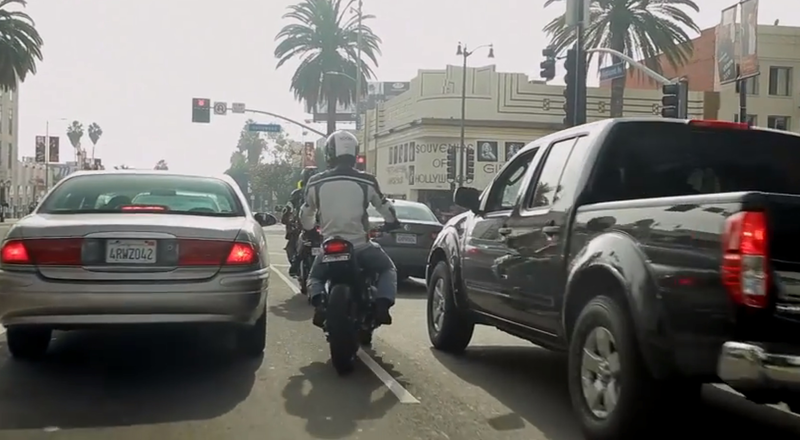 There was talk this past year about outlawing lane splitting in California, as some drivers get unnerved by it, and some feel it is unsafe for motorcyclists who of course are likely to lose should they misjudge a car changing lanes. But most agree the opposite is likely to happen. 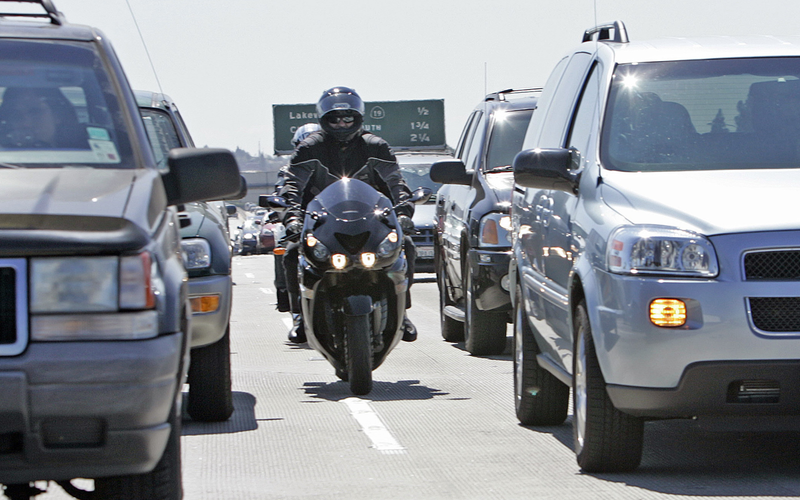 Lane splitting will move from a gray “not illegal” area to being made officially legal. The benefits of the practice seem to outweigh the negative and as long as riders are taking precautions and drivers know that motorcycles can share their lane, and most Californians seem used to the practice, then all is good.